Today is polling day in Barnsley, where the Labour candidate Dan Jarvis is expected to win comfortably. “There’s going to come a time when Labour’s going to need a new idea apart from “we are not the nasty Tories” even though that has worked well for them over the decades. I’ve said this time and again, but likening Thatcher to Cameron is not a strategy for success. It might make Labour die-hards feel good, but the electorate are not dim to the fact that Thatcher was 20 years ago and Labour have been in government for 13 of them since. I would just like to say, I have been a labour party supporter all my life. It has taken the conservatives, to stop clamping stop snooping council, restrict the polices judge jury and executioner role. The labour party was in power for 14 years or so, what rights did they give to workers or employees. The only allowed political correctness to go out of control. Where everybody is afraid of everybody else for fear of hurting someone’s feelings and get punished by some labour politically correct quango and getting a £30,000 penalty, like one hairdresser did. It also taken the conservatives to recognise that the state of the dependant society that labour party introduced needs tackling. Image if labour was still in power more spending more spent on hiding unemployment. Don’t listen to what the current leader says he would not be the leader it would be GB trying to cover up his decisions on how it was not his fault that the country is in a mess. Remember he never apologises and he is never wrong. That had 15 years and they screwed up big time just like last time. The worst thing is they still won’t admit it. They took us into 2 unwinnable wars and none are over to date. I assume that most of the real labour MPs are ashamed at the current state of the party and also they vocally backed them when they were in power, they must feel they betrayed their principles every step of the way. They have no authority now to talk on issues concerned with this county. When they had the chance the allure of power was too great and their voices were choked by power. Great work on the site still, well done. As a teacher in barnsley i feel i can comment on this one. The ‘anti-Tory’ vibe which stems from Thatcher doing over the mines is still very much present amongst many voters. Barnsley is still a very deprived area and for the past 25 years there has been little to change the mind-set away from anti-thatcher, and therefore anti-Tory. Even though the youngsters in Barnsley don’t know in depth why they are anti-Tory, there is little doubt that when pressed most are. 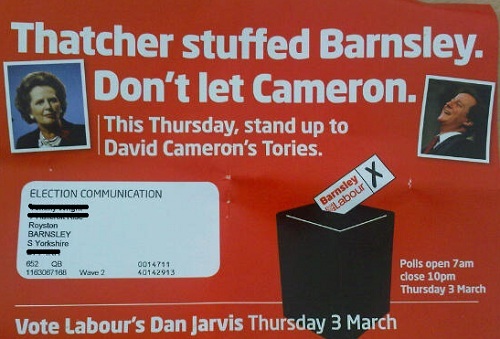 For this reason I can see why Labour still use this negative campaign tool. I think your right to claim the electorate will see through such approaches IN CERTAIN INSTANCES, but not here, not yet. MB of Barnsely! That’s an interesting perspective. Perhaps you’re right, in certain circumstances, deploying Maggie might be beneficial to a Labour campaign. However, too often, Labour use it as a fall-back for when they’ve got nothing else to say.